Transfer from Toronto to Niagara Falls. As you wind your way into Niagara Falls you will catch your first, unforgettable glimpse of the imposing American and Horseshoe Falls. Overnight in Niagara Falls. Step aboard a Niagara Airbus coach for a tour of Niagara Falls and Niagara-on- the-Lake. On this fullynarrated trip you will see the Floral Clock and drive along the scenic Niagara Parkway to Niagara-on- the- Lake. You will enjoy some free time to browse through this picturesque town. A guaranteed highlight is the thrilling boat ride on the Maid of the Mist to the base of the spectacular Horseshoe Falls. 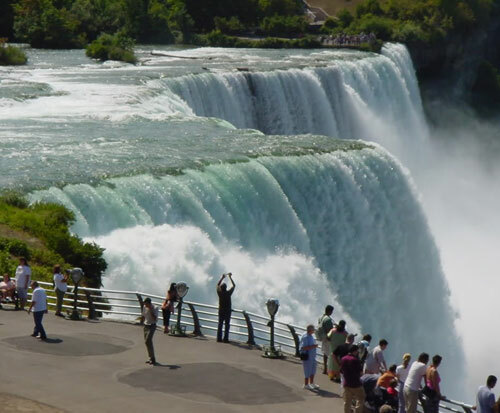 The tour includes a lunch with magnificent views of the roaring falls.Overnight in Niagara Falls.